I will use excerpts from an article in The New York Herald Tribune on Saturday, March 13, 1954 to give a first hand account of this unique and trend setting restaurant. 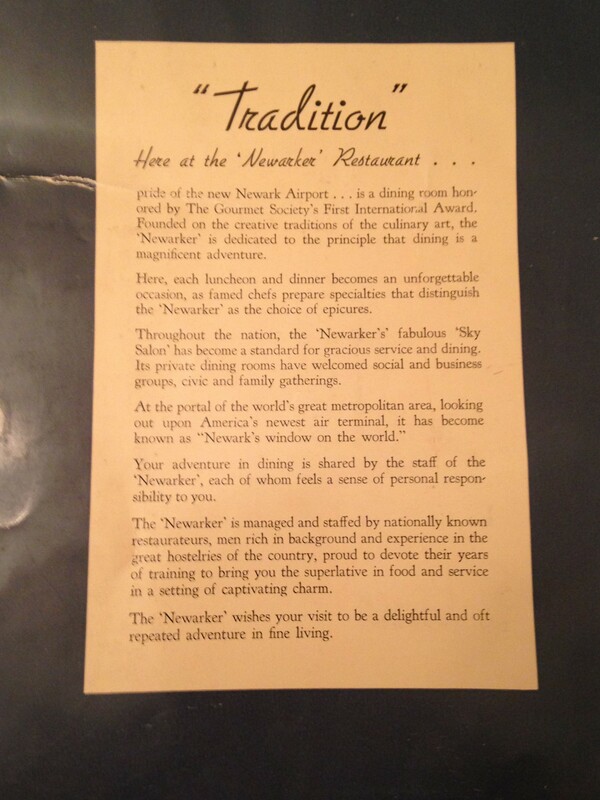 I found this article tucked in the menu pictured above which is from the first year of the Newarker.. The reporter arrived at the Newarker via helicopter from La Guardia Airport in New York. “We are landing now, this is the Newark Airport, destination the Newarker, one of the finest of New Jersey restaurants. Their are plenty of other ways to get there, of course, but for real adventure go by helicopter. Soon you may ! A dinner flight is being scheduled to arrive around 7:30. In the beginning not so handy, but something to do at least once in a springtime. The take-off will be from La Guardia to include Idlewild (now Kennedy) , then to Newark. Imagine that trip at the sunset hour ! The Newarker is no ordinary airport restaurant. It aims to serve the north Jersey residential area for dinner and being in the center of an industrial district has in seven months become the luncheon rendezvous for big business. On Sunday some 1,000 dinners are served and the daily average runs away over 400. To date over 80 per cent of the guests are drawn from near by, with a scattering of travelers. Good food here. Joseph Baum sees to that ; he manages the place for the Restaurant Associates of New York State and New Jersey. His able right hand man is Albert Stockli of Switzerland. His second lieutenant is Paul Pierre, artist with pastry. There are actually four restaurants in the Newark Airport, all under the Baum managerial eye, the coffee shop,snack bar, cocktail lounge and the big room, which latter seats 245 people. Off the restaurant proper are two rooms for private parties and overflow. In one of these is a mural we want you to notice, the Waverly Fair of about 1871. In the years 1867 to 1899 this fair was sponsored by the New Jersey Agricultural Society, a gala annual event given on an eighty-acre tract at Waverly Station. (now Weequahic Park) These fairs were the forerunners of the New Jersey State Fair held now in Trenton. The author then goes on to describe the food. A brief excerpt here,” Don’t order the antipasto unless you want to spoil your appetite; it’s a full meal. The cost is 90 cents and every serving is king sized “. Joseph Baum continued create award winning restaurants including: The Four Seasons , The Brasserie, La Fonda Del Sol , The Forum of the Twelve Caesars and Windows on the World to name a few. 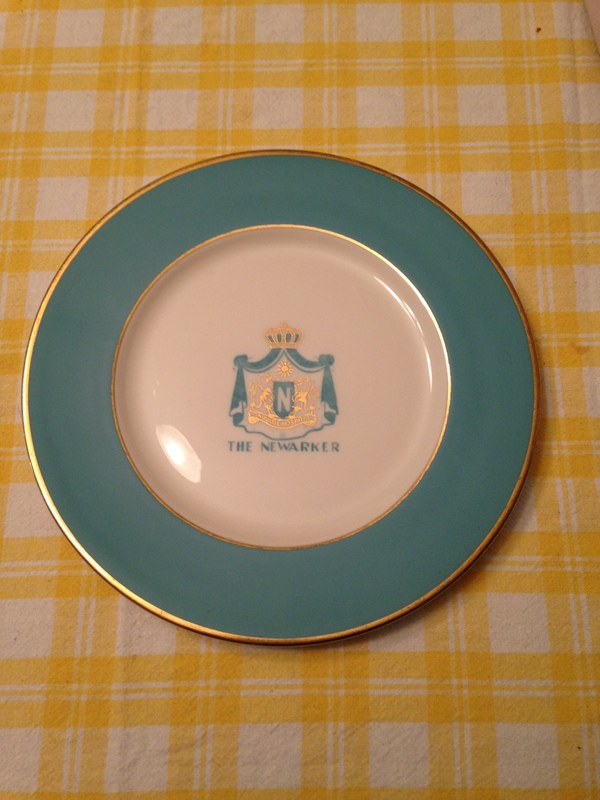 My Grandfather worked at the Brasserie from the time it opened in 1959 until he retired almost 25 years later. My uncle was a pastry chef at the Four Seasons. Good memories. Have you got any idea where this restaurant was? In a building that no longer exists? 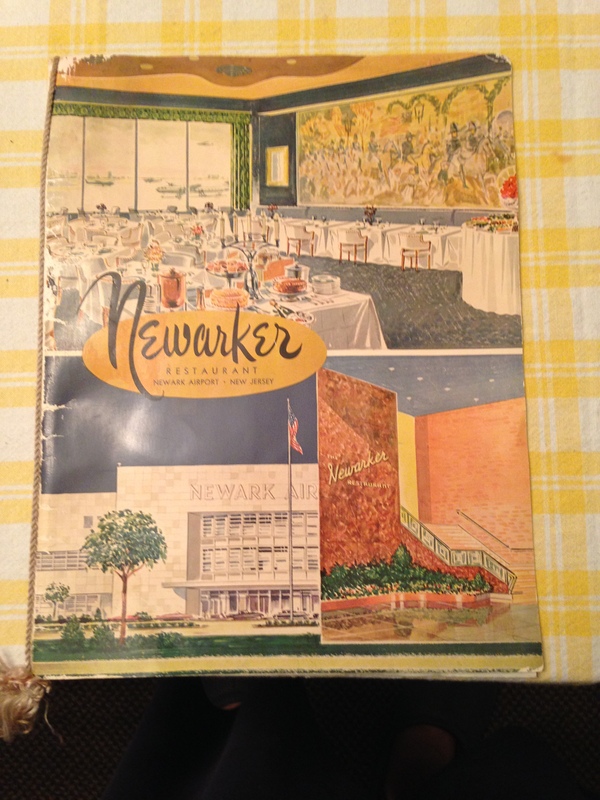 The Newarker Restaurant was in the north terminal which has since been demolished. I remember seeing the restaurant from outside in the lobby, and some old ads in the paper. i had my sweet sixteen party at the Newarker in 1964!!! If you have any photos you’d like to share, I’ll put them in the post. I always welcome the opportunity to share someone’s story. Wow that must have been a memory. I never went n there, just always saw the stairway and entrance inside the terminal building. I remember we also went there once for thanksgiving. But that’s about it. Used to go to the airport to watch the planes take off !! Yes, we rarely went to the airport but the few times we did, I remember much. Oh I just recalled, how cool the curving ceiling inside the terminal waiting room was too. As a young kid, I thought that was cool!! Thank you for sharing your memories. How different air travel once was.